Understanding the message that a woman is trying to send you is hard, even in a direct conversation. That means figuring what a woman actually thinks about you in an informal situation, such as a date, can be almost impossible. Here are a few behavior patterns that can indicate if a girl likes you or is simply being polite to you. But you need to be real careful when you start reading the messages girls send you because it’s real easy to get confused. A lot of guys end up confusing a woman by trying to be polite or courteous with one who actually likes them. For example, a lot of women hug all male acquaintances as a matter of simple courtesy. She actually reaches over and touches you. Women like to demonstrate affection or interest through physical contact, such as hugs. One of the main ways a woman will demonstrate affection is to touch you. The touch can be anything from a simple nudge to a full-fledged hug because every woman is different. She becomes playful and flirtatious. If a girl suddenly starts acting like your playmate, wanting to share in your activities and laughing at your jokes, she is interested in you. She becomes thoughtful and starts doing things for you. If a woman starts doing things like cooking meals, buying you presents or helping out around your place, she is definitely interested in you. She tries to hide her emotions and thoughts to protect your feelings. If a woman starts going out of her way not to offend you, she definitely likes you. This can be something as simple as not getting angry or trying not to criticize you. She starts staring at you all the time. If a girl starts going out of her way to look at you, she’s definitely interested in you. If she tries to hide the fact she’s looking at you, that’s even a better sign. She goes out of her way to be around you. If you start running into a woman at places like the store or your favorite restaurant, she is trying to be near you. She starts talking about you to her girlfriends. If a woman becomes embarrassed when she sees you watching her with her friends, that’s a sign she’s interested in you and talking about you. She likes to ask you for help. It’s natural that kids in your class come to you, asking about homework or tests if you are a good student; however, if a girl ask you a question which could be easily answered, it probably means she’s into you and wants to spend more time with you. Keep an eye on that! She starts asking you about the other women in your life. If a girl starts asking about your girlfriend, former girlfriends, ex-wives, mother, sisters, etc., she’s definitely trying to learn more about you because she’s interested. She gets upset when you ignore or neglect her. If she gets mad when you cannot make a date or do not return a call, she is definitely interested in you. A video that can help. 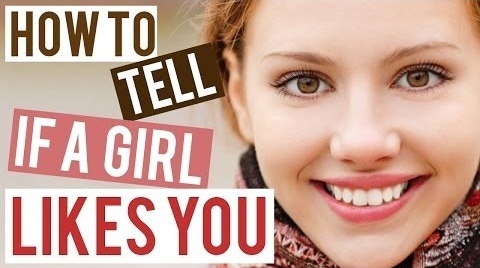 If you’re still confused about women, check out this short and very entertaining video which offers some interesting advice that can help you tell which girl is actually interested in you. Server responsed at: 04/21/2019 10:45 p.m.